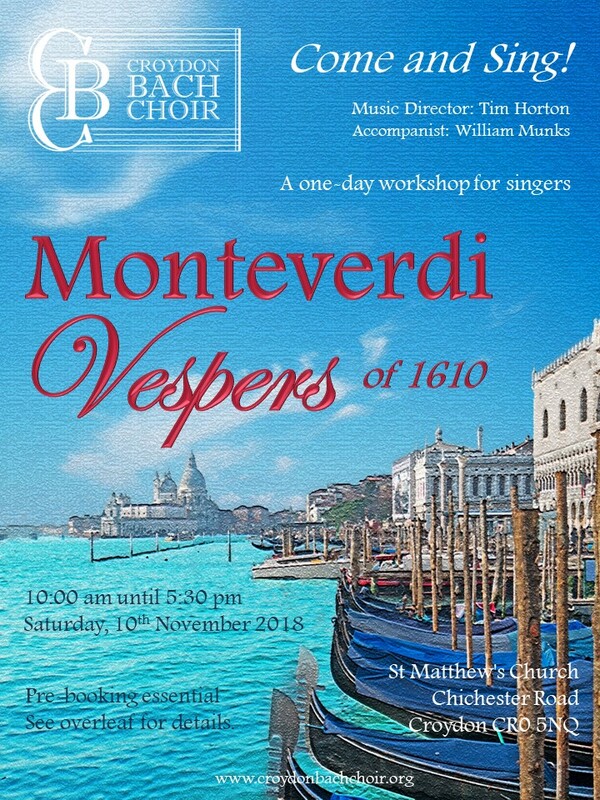 If you love singing, don't miss this marvellous opportunity to spend a day with members of the Croydon Bach Choir exploring and performing Monteverdi's Vespers of 1610, under the inspirational direction of Tim Horton, our Music Director and William Munks who will accompany on the piano. This is a full day's workshop and is open to singers of any standard who are able to follow a score. It will be held on Saturday, 10th November 2018 in the modern, light and airy St Matthew's Church, which has excellent facilities, including easy access for the disabled and plentiful parking. Ticket prices include tea, coffee, cakes and biscuits during the breaks, but we suggest that you bring something for your lunch. The day will end with a free informal public performance. £20.00 for singers including score hire, students free, tickets for evening performance free.